For the past month, I’ve been exploring much of Shuri to learn as much as possible about this city that was once the center of the Ryukyuan kingdom before Okinawa became part of Japan. I have seen many beautiful sites, learned much about history, and had a great time on the way. This week, I decided to try to go even further back in history and learn about the people of Okinawa before the Ryukyu kingdom was born. I packed my bags and returned to Shuri for yet another glimpse back in time. To start my quest and hopefully find answers about the prehistoric dwellers of Okinawa, I decided to head to the Okinawa Prefectural Museum in Shuri in search of answers. Though I didn’t learn as much as I’d hoped to about the ancient dwellers of Okinawa, I did learn quite a bit about the island and it’s history at the museum. For those history buffs out there, this is a must see. The giftshop is located less than a kilometer from the Shurijo Castle Park and is an excellent place to learn about Okinawa’s history, arts and crafts, culture, folklore, wildlife, and more. 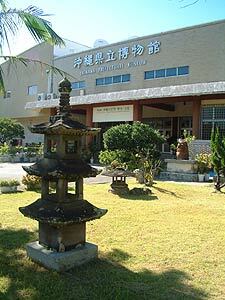 The museum has a permanent division that is divided into three areas: Okinawa’s nature, culture, and history. I spent most of my time in the history area reading everything that was available in English, which wasn’t really much but it was at least something. The most interesting items I noticed on display included a few written tablets with ancient hieroglyphic like engravings. Another section of the museum went into detail on Okinawan textiles, lacquerware, pottery, and other forms of art. Still another had specimens of many Okinawan animals on display. The museum also has a theater and occasionally hold exhibits on remote islands and locations within the prefecture. The first floor of the museum also has a gift shop with several souvenirs and books on sale. I was hoping for a detailed book on Okinawan history, but there was nothing available in English. However, I found a book about many great sites on Okinawa I had never heard of, so I left the store satisfied with the knowledge that I had just been introduced to many months more of adventuring on Okinawa. There were, however, colorful books about Okinawan artwork that would be interesting to anyone regardless of whether or not they can read Japanese. The museum has a lot to offer for those who are seeking to learn more about this beautiful island. Admission to the museum is very low priced at ¥210 for adults, ¥100 for university and high school students, and ¥50 for junior high students and younger children. The museum is located right around the corner from Shurijo Castle Park, so I recommend that you drive to the castle, park at the paid parking, and go for a hike looking for the museum. To get to Shurijo, drive south on highway 58 towards Naha. At the Tomari intersection, turn left towards Kokusai Street, drive straight through the Asato intersection, get on Daido road where the road splits, and you’ll soon see signs for Shurijo Castle Park. The museum is right behind the castle park by the Ryutan Pond. Another spot worth checking out is the remains of the Enkakuji Temple. 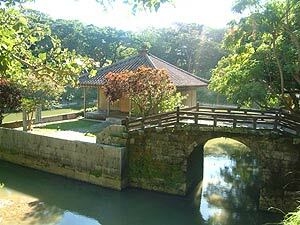 This temple is located right inside the Shurijo Castle Park and was once the head temple in Ryukyu of the Rinzai sect of Zen Buddhism. It was the most impressive temple in all of the Ryukyus and served as the family temple of the kings of the second Sho dynasty. Enkakuji was built over a period of three years from 1492 by King Sho Shin to enshrine the spirit of his father Sho En, predecessor to the throne. This site was dedicated as a National Treasure in 1933 but was mostly destroyed in the “Typhoon of Steel” during the battle of Okinawa. The main gate and two side gates were rebuilt in 1968 and the Hojo-kyo bridge was rebuilt a year earlier. The Tennyo-bashi bridge spans the Enkanchi Pond to Benzaitendo Temple inside the Shurijo Castle Park. It was constructed in 1502 during the reign of Sho Shin and is of a style found frequently in southern China. 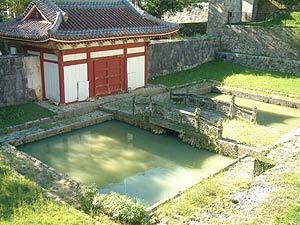 During Shurijo Castle’s glory days, the Ryukyuan people often traded with China, and many influences in art, music, and culture were introduced to the Okinawans. The Tennyo-bashi’s design is one indicator of such influences. In 1972, this site was dedicated as an Important National Cultural Property. The Kinjo-cho stone pavement road is believed to have been completed in 1522 during the reign of Sho-shin and is the most typical pavement made in the monarchy era. This was one of the main roads to the southern region of Okinawa and is still currently used by the residents and visitors of Shuri. The Kinjo-cho stone pavement was declared a Prefectural Historical Monument and Scenic Beauty in 1964. Six massive trees called Akagi grow within the grounds of Uchikanagusukudake. Each is estimated to be more than 200 years old and over 20 meters tall. These trees are found all over the Ryukyu islands, and they once grew abundantly inside and outside of the castle grounds. However, during the Battle of Okinawa in World War II, most of the area was burnt to the ground and these are the only ones found near a residential area. These magnificent trees are certainly a site to see! They are located next to the Kinjo-cho stone pavement road.